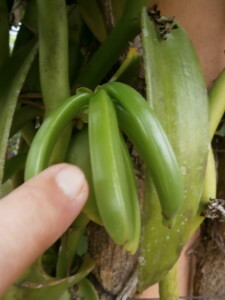 The growing of vanilla is not so terribly difficult in tropical countries like Thailand and Laos. You just let them climb up a tree, pole or wall and keep them moist. This is easily achieved by regularly spraying them with water and fertilizer. But you should not fertilize your Thai and Lao vanilla heavily near the ground since the roots there are easily damaged. And when they reach a height of about 2 meters you should turn them around so they will to grow downwards again. 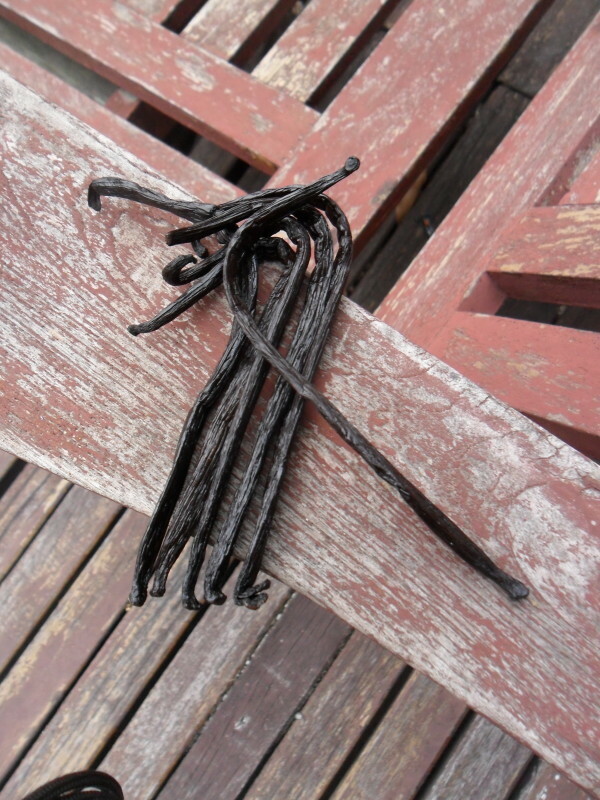 Mexico had a highly profitable monopoly for vanilla, but with the beginning of the 19th Century other tropical farmers tried to grow vanilla in their colonies. That was not so difficult, the plants grew well and flowered too. But there was no yield. The vanilla spice is produced from the namesake seed pods, but outside of Mexico the growers were not able to grow those precious seed pods. 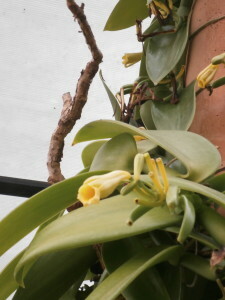 There is only one specific bee native to Mexico that can naturally pollinate the vanilla flower. 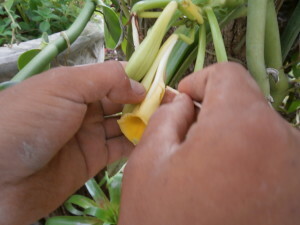 Only in 1841 Edmond Albius in Reunion, a 12 year old slave, developed a simple and effective way of hand pollinating the vanilla flower which flourishes only one day. I have seen the method in Mexico where nowadays the commercial growers also use that simple trick since it increases the yield considerably. So if you want to grow your own vanilla in Thailand or Laos you just take a tooth pick and cut the flower open on the side. 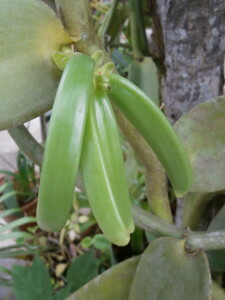 Thus you enable the pollination of your vanilla plant. Since you need to hand pollinate your vanilla plants, hinder them to climb higher than 2 meters by reversing them. 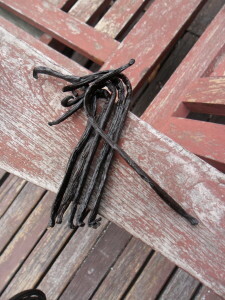 Now you just wait a while and you can enjoy your own home grown Thai and Lao vanilla. 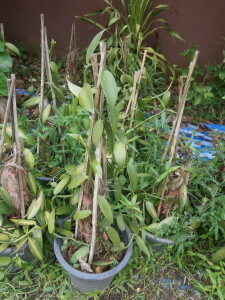 We always have vanilla plants for sale at Discovery Garden Pattaya and Nong Khai. How old are the Vanilla vines that are for sale? Time frame from replanting vine to production? our vanilla vines are 450 Baht each and it will take two years until you can harvest. Cinnamon: We have small trees at 250 Baht and huge ones (about 2 meter) for 3000 Baht. wie lange dauert es bis zur Ernte, wenn man mit Vanille-SAMEN die Plantage startet ? Verkaufst Du hetrocknete soursop Blätter, wenn ja, wie teuer pro kg ? wir haben noch nie Vanille von Samen gezogen, wir ziehen neue Pflanzen von unseren bestehenden. 1 kg getrocknete Soursop Blätter kosten 2500 Baht. kann man bei euch Vanilla Schoten kaufen? Falls ja, zu welchem Preis. leider haben wir erst Pflanzen, aber vielleicht in einem Jahr oder so, sollten wir wohl welche haben. 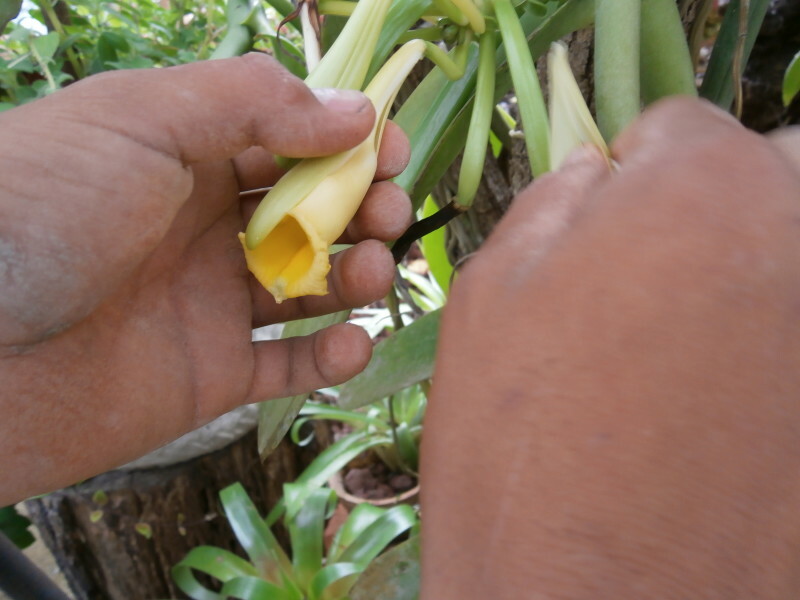 is it possible to ship vanilla plants and cinnamon seedlings fro your Nong Khai property to Luang Prabang in Laos? Wow……I have been looking through your site, been looking for this sort of resource for years. Can you send me your price list so I can see what variety of plants you have. Next time I am in Nong Khai I will contact to come visit. Further to my message above, do you also have any fig seedlings? I do not think we can send above plants to Luang Prabang, but they could be picked up in our Nong Khai location. I will soon drive up from Pattaya to Nong Khai and could take them there for you. If you are interested in that, I need to know asap. I have attached a price list for your convenience. I’m not that familar with WordPress so might be missing something but I can’t see any price list attached. When are you planning to come to Nong Khai, I will see if I can fit this in?